When I was a little kid, there was nothing I loved more than the Legion of Doom. Not the professional wrestling team consisting of Animal and Hawk, but instead the villainous team that faced Hanna-Barbera's Super Friends for one season during the 1978-79 cartoon season. Only 16 episodes featured the Legion of Doom, but their iconic and unforgettable run inspired an entire generation of creators and fans. What made this season of Challenge of the Super Friends so special, and so much better than any other season, was the fact that the villains were as important as the heroes. Every other season of Super Friends varied from boring to a "ehh it’s ok". There were a few episodes here and there, like when the Super Friends were transformed into gnomes and had to do slave labor for a Middle Earth Wizard, or when Superman was closing a volcano and the explosion made him switch with his evil world doppelganger. 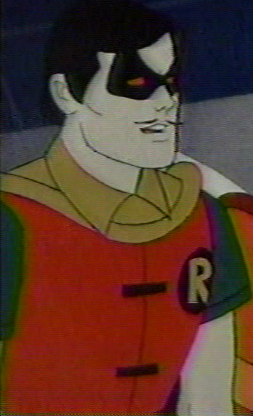 Usually doppelgangers have a mustache, as evil Robin did. 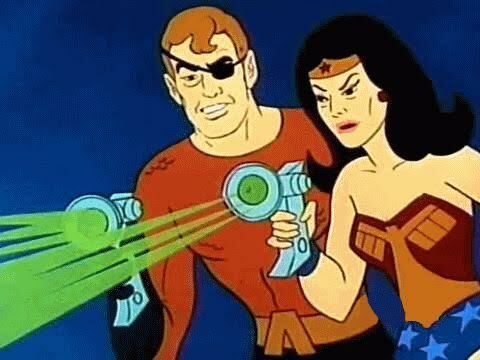 Evil Aquaman had a sweet eye patch, and apparently Wonder Woman was evil because she was super tired. With varying quality, any episode of Super Friends was a crap shoot of whether it would be any good or not. But when you saw the Legion of Doom on, you knew it was an awesome episode. Kind of like the beard on Ryker in Star Trek: The Next Generation. What made the Legion so amazing? The villains were allowed to be evil and do evil things. Evil things in cartoons became far more acceptable in the 80s, but not so much in the 70s. Skeletor, Mum-Ra, and Megatron were allowed a new level of evil in children’s cartoons because of the trail that was blazed by the Legion. In one episode, the Legion of Doom DESTROYED the Earth. This BLEW my mind when I was 6, the bad guys just straight-up killed everyone. This was not happening in the 60’s cartoons aimed at kids. Don’t worry though, some Hippie Aliens brought the Earth back at the end of the episode. Another great quality of the shows? The science in any given episode was INSANE. I could do an entire thesis on the Super Friends Science ™ insanity (Hawkman walking towards the Earth’s core without breaking a sweat, Batman going through time just using the Batplane, Flash running in the sky, so much more, so, so much more) but that’s for another time. Instead I want to focus on the characters, or at least their evolution into the 80s. Glorious. Where is this action figure set DC? 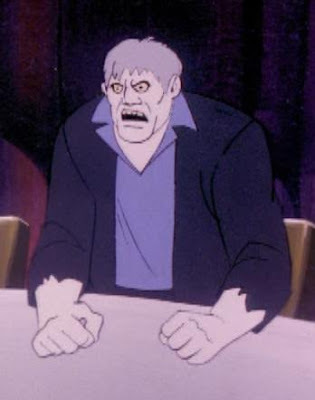 The first villain that I want to focus on is Solomon Grundy. That’s the pale dude all the way on the right. I am obsessed with Solomon Grundy to the point I collect all the comics he has appeared on the cover for, and have over 100 commissions of Solomon created by artists. So I feel like starting with him. If you are at all obsessed with him too, e-mail me. He’s just sitting there, what’s he so angry about? BECAUSE. They sort of explore Solomon’s origin in one of the episodes, but if you don’t know, Solomon was a gangster named Cyrus Gold in the 1890’s, and was betrayed by his fellow gangsters who shot him up and threw him in the swamps of Gotham. Where are the swamps of Gotham? Once on a map I found of the DC Universe geography, Gotham was located right where New Haven, Connecticut is. It’s always been the dark side of NYC for me, but then recently I saw some scientific study where New Haven was the average American City when it came to race and economics. So maybe? No matter where Gotham is, there are swamps in there, and Cyrus Gold was dumped into them. Some magic stuffs later, Cyrus rose back to life, all pale, torn up clothes, hair not combed, and the size of the Incredible Hulk. This happened in comic book land in 1944, so it pre-dates the Hulk (don’t get it twisted). He stumbles into a group of hobos who ask Cyrus, “Whats your name?” Cyrus can only remember “I was born on a Monday.” So the hobo calls him Solomon Grundy, after the poem. I love 1940’s origins. Hobos. Poems. Magic swamps for no reason. His first opponent was the original Green Lantern, whose power ring didn’t work on wood, and Solomon was made out of wood, sort of. 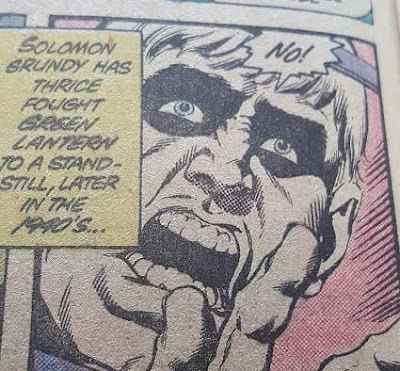 So they fought and Solomon "died" when Green Lantern threw Grundy in front of an oncoming train, because he couldn’t use his ring. 1940’s Heroes! Murdering like whatever. 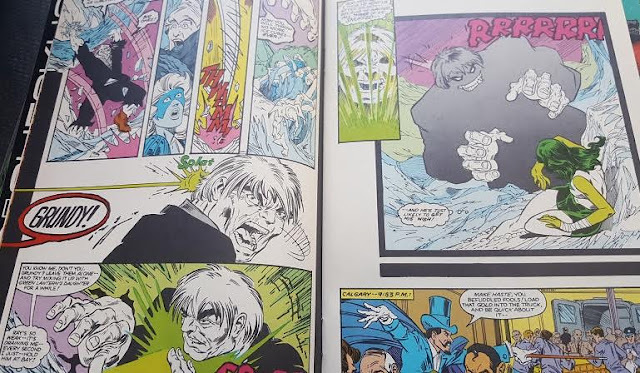 A few more appearances in the 40’s, the JLA in the 60s, and Superman in the 70’s; the powers that be felt a southern gentleman zombie hulk type would be a perfect fit with the Legion of Doom. 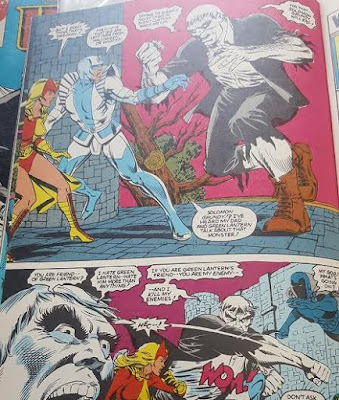 After all of his Legion of Doom SUCCESS, all his amazing star making appearances like "Swamp of the Living Dead", and the modern Shakespearean zenith of awesomeness "Monolith of Evil", he was ready for the DC in the 1980s!!! His body fused with the cars because of friction. Was he still wood? So that’s how that went down. Next time Solomon and Superman crossed paths, Swamp Thing got involved (1979's DC Comics Presents #8 with art by Murphy Anderson). Swamp Thing also died and was transformed by the Swamp, so there’s a kinship between Swampy and Grundy. 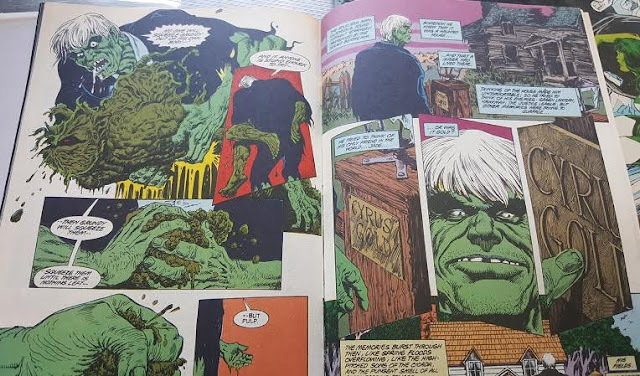 In a weird Steve Englehart story, Solomon is once again a dumb Hulk character, but becomes more sympathetic because they explore the kinship, and Swamp Thing feels Grundy might hold an answer on how Swampy might return to his human form. This pre-dates the Anatomy Lesson. If you haven’t, go read Alan Moore's Anatomy Lesson. NOW. Solomon does not like rats. So I won’t do a blow-by-blow of the issue, but let’s just say Superman kills a bunch of Grundy’s while Swamp Thing tried to stop Superman from killing them. And big surprise Grundy did not hold the key to Swamp’s return to human. Sad! The next major appearance is from Roy Thomas' Earth-2 classic comic All-Star Squadron (first 3 issues with art by Rich Buckler and Jerry Ordway - 1981). NOTHING screams 80’s to me like Roy Thomas doing Earth-2 characters. Maybe Giffen doing Legion of Super-Heroes or Perez on Teen Titans, but you give me any combo of Thomas/Ordway and I'm 10 years old again. So Per Degaton had pulled Solomon Grundy from the future (1947) and brought him back to 1941 to be one of the Squadron’s first fights. I felt Thomas was one of the first to really explore Solomon as more than just an idiot. Strong and dumb, but suddenly it felt he had some emotions. Shining Knight decides to flood the Submarine Grundy and Knight were fighting in. He hates water as much as rat I guess. BTW Shining Knight has a Pegasus. 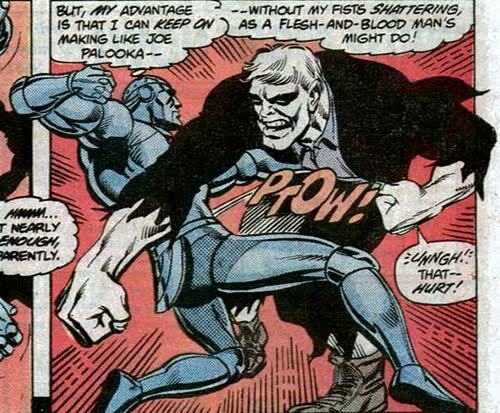 Grundy fighting Robotman, who was created by Siegel and Shuster. Make Mine DC in the 80s! 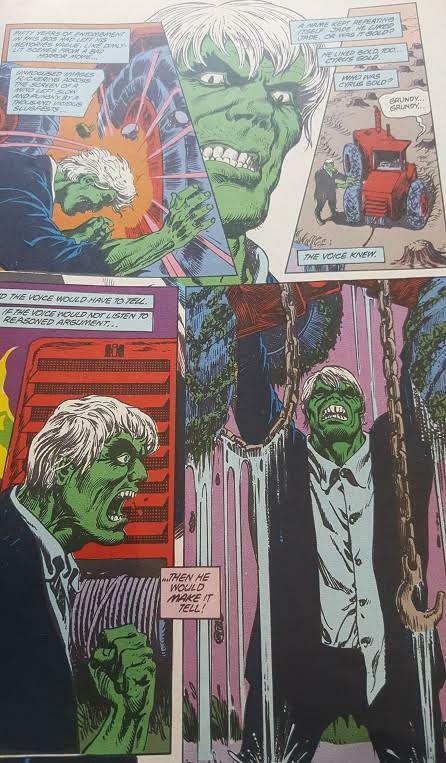 I’ll admit I’m not much of a fan of the poem, more so the Hulk Zombie Earth-2 DC Villain aspect of him. 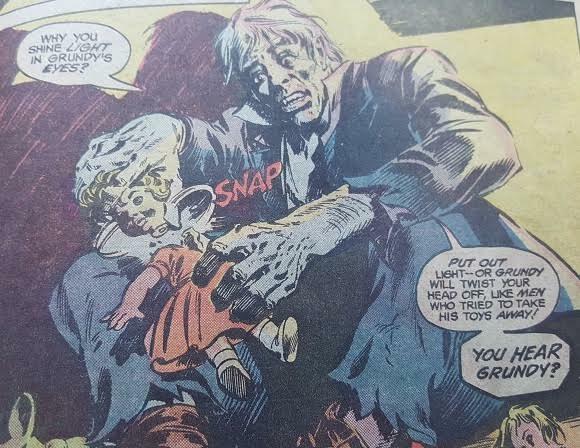 Now there was a weird story in 1983's Detective Comics #523 (art by Gene Colan), where the Earth-1 Grundy is suddenly obsessed with dolls and is being used by Gotham City gangsters. Not sure why he suddenly liked dolls, but the story was pretty good, especially with Colon’s moody, dark art. BTW, Batman kills Solomon in the end of this one, too. (...and in a messed-up, gruesome kind of way. Go buy it and see it for yourself.) 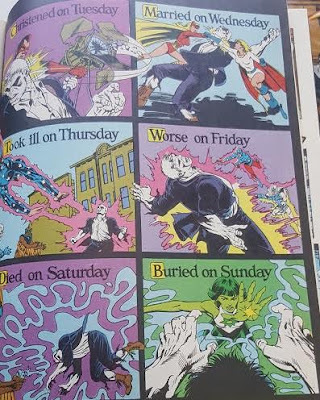 If you're keeping count here, both Superman and Batman have murdered Earth-1 Solomon Grundy at some point. I don’t have his Wonder Woman appearances, but I imagine she murdered him, too. 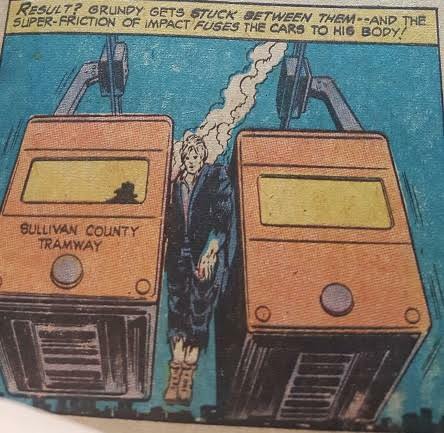 Roy Thomas continued on with developing Earth 2 Grundy in Infinity Inc., and featured him in issue #36 (drawn by a young Todd McFarlane - 1987). In this Zombie White Hulk ends up falling in love with Jade, because she saved him from the ice. 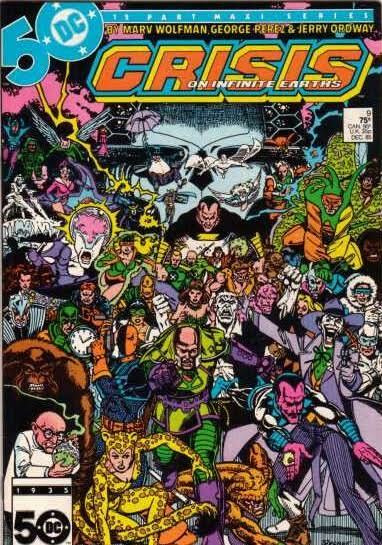 There he is, right behind 80s Luthor, Joker and Sinestro. Being all Hulk Smash, amiright? Then he finds his old house from his past life and he gets flashes of memories. He eventually jumped into an chemical bath and washed the green off of him and went back to being zombie pale. Honestly, southern zombie DC villain Hulk is the best archetypal role for Grundy. Recently they’ve tried other variations of Grundy and I just don’t want it. He will always be the Challenge of the Super Friends version to me, and the version that appeared in Earth-1 and Earth-2 DC stories in the 80s. 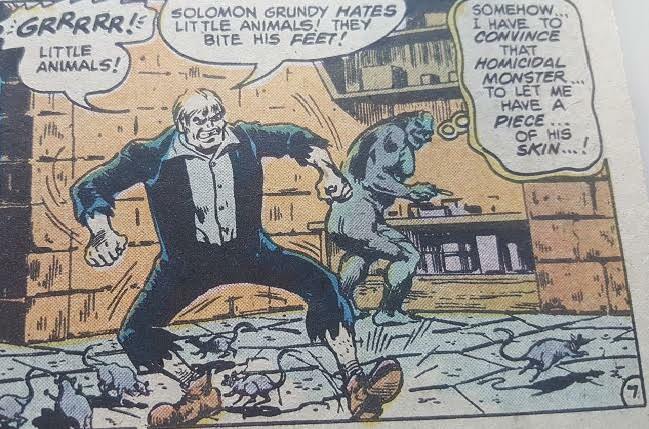 I’ve always wanted to write a Solomon Grundy finding himself in America story, and maybe one day I’ll get a chance. And if I do, it will be this version of him. Dumb, dead, and craving pants.